The “Aeneas Hall” stands to the left of the “Mercury Circle.” It is a simple architectonic room that contains on its walls and ceilings, fresco scenes narrating the tormented adventures of the mythological prince of the Dardanians, son of the mortal Anchises (cousin of the king, Priam of Troy) and the beautiful goddess, Aphrodite. Amid decorations characterized by architectonic frames, big and grotesque masks enlivened by fantastic-mythological creatures, a particular scene stands out. It narrates the end of the war of Troy, with its wall revealing the famed wooden horse. Aeneas is depicted in the deep of the night, while he is escaping from the burning city together with his little son, Ascanius, and his elderly father, Anchises, who Aeneas is carrying on his shoulders. 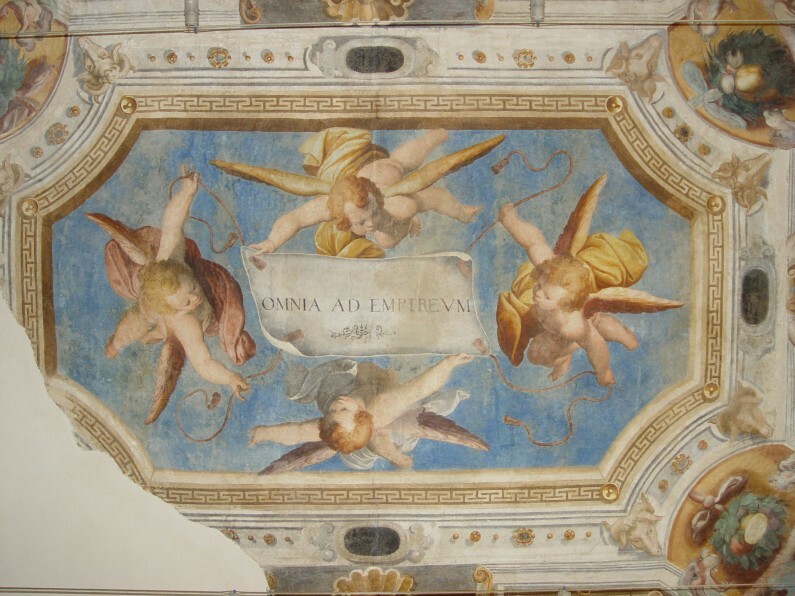 The centre of the ceiling is decorated with a scroll containing the Latin inscription “Omnia ad empireum” (“All things come down from heaven ”), sustained at the sides by four cupids, highly shortened, who seem to be seen from above against the background of a brilliant blue sky. It is the pendant of the scroll found in the hall located on the other side of the entrance circle, the so-called “Room of Mirrors,” and both refer to the devotion of the patron and owner of the Villa, Pirro I Visconti Borromeo, recalling that all things descend from Heaven and will return to it. Once again the frescoes of the villa offer symbolical elements to its present guests, as in the past, to be interpreted in many ways. Besides the narrative and devotional levels, the scenes depicted in this hall represent the qualities of the master of the house, always loyal to his own family and friends, and like Aeneas, willing to help others also in times of danger. The Greek hero, in fact, personifies the ever-faithful force who comes to one’s aid even in times of adversities and can entrust himself to the divine will, certain that justice will strike his own enemies and those who win through deceit. Critiques retain that this pictorial piece is likely to have been achieved by the Bolognese painter, Camillo Procaccini (1561-1629), who already worked on the Nymphaeums between 1587 and 1589. With his partners, he probably produced the decorative design of the frescoes on the ground floor of the 16th-century wing of the Villa. Among his partners, at least two appear on the records in the administrative ledger of Pirro around 1602 and 1603: the less known were Agostino Lodola and Giovan Battista Maestri, so-called Volpino. The walls today have been opened with windows and doors leading to the park at the back of the 18th-century wing of the Villa. Among the two French windows leading to the 16th-century portico, there was once a heater lined with brickwork, which was loaded directly from the outside.